Dr. DeFoore's Healing Anger Newsletter entitled "Admitting When You're Wrong"
What Roles Do You Play In Your Marriage? It's going to happen. You're human. And, when you know how to handle being wrong and moving ahead, you'll be much stronger and more successful in your relationships. 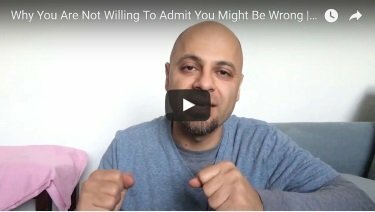 While it may seem strong to "always be right," it's actually a huge weakness...and it's just not true. Plus, you're very likely to get angry while defending your viewpoint and trying to prove that you're right. This is not about winning the argument, it's about reconnecting with your partner. Remind yourself that your relationship is more important than who's right or who's wrong, and set the goal of reconnecting with your partner. So, even if you don't know for sure if you're wrong, just acknowledge any element of truth you can find in your partner's viewpoint. Empathy skills really help here. When you do realize you're wrong, or if you know you've somehow hurt your partner's feelings, start by apologizing and stating the intention of reconnecting. Practice these communication skills to resolve conflicts, when a simple apology isn't enough. Remember that it's a sign of strength to be able to admit that you're wrong, and a weakness to have to always be right. I know this isn't always easy. If you have a lot of personal shame, for example, it may seem impossible to admit when you're wrong and apologize, because it might feel like falling into a pit of shame and self-loathing. So, you want a strong foundation emotionally, in order to do this successfully. That's what you'll get by building your self-esteem, and doing other types of inner work on yourself. The important thing here is that you're taking responsibility for your actions in order to make the relationship better. Responsibility is sometimes described as "response-ability," or the ability to respond. "Taking responsibility for yourself increases your freedom to choose and act according to your very best of intentions." This is not about groveling or beating yourself up. It's simply a matter of stepping up and doing the right thing. A friend once asked me, "Would you rather be right or happy?" Good question. The point is, if you get too attached to being right, you might have to give up on happiness along the way. Keep your positive connections strong by discovering all of the ways to participate in the Goodfinding Community Online page. Here's the deal...sometimes you might think that apologizing after you've hurt someone should make it all better. It doesn't. It might help, but only if it's followed with lasting behavior change. You know, the whole "actions speak louder than words" really applies here. Empty apologies just won't cut it. While it may be hard for some people to apologize, it's certainly easier to say the words, "I'm sorry" than it is to change your behavior and keep that change in place no matter what. Be sure you've taken care of your own underlying emotional issues. The Nurturing Your Inner Child program is perfectly suited for this. Put yourself in the other person's shoes, and try to imagine how they felt when you did whatever you did. Express this to them, with statements like, "When I look at this from your viewpoint, I can see how you felt (hurt, scared, angry, disappointed, upset)." Take a look at your own personal history, and how your actions relate to that. Acknowledge the underlying issues behind your behavior, and make a commitment to work on those so that it doesn't happen again. Use these mental rehearsal techniques to plan how you're going to respond and behave differently in the future. Make your apology "stick." Don't actually apologize until you're ready to do the work on yourself to make sure the wrongdoing doesn't happen again. Self awareness is key here. You have to know about your own shortcomings, triggers and areas of weakness to successfully apologize and change your behavior from that point forward. If you don't know yourself, you really don't know what you're "bringing to the table" in a relationship. If you love that other person, you want to make sure you're offering them a good deal in the relationship. You can see how self love and self-esteem fit in here...if you feel good about who and how you are, then you know you're offering something good and valuable to your partner. 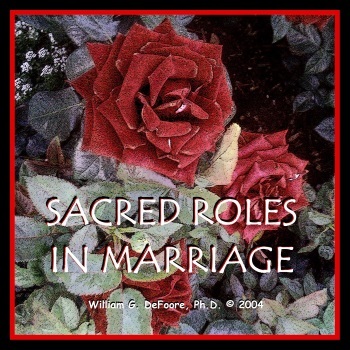 This highly effective audio program, available as a CD or MP3 download, will help you understand and improve the roles you play in your marriage and other important relationships. New web pages for you. Read new contributions from good folks like you, such as I'm A Good Woman But An Angry Mom by a woman who desperately wants to be able to show love to her children, and My Husband Is A Bully by a woman trying to decide on what to do about her marriage..